Mobile data devices are a boon for AT&T. The company reported strong earnings this morning, seeing a 26 percent rise in fourth-quarter profit. AT&T sold 3.1 million iPhones in the fourth quarter, with the device being called out as one of the key drivers of the success for the telecommunications company. Quarterly earnings increased to $3.01 billion from $2.40 billion from the previous year, matching Wall Street expectation. Revenue from wireless services was strong, rising 9.2 percent with the addition of 2.7 million net subscribers during the fourth quarter. But another area of growth for AT&T is in wireless eReaders connected to its 3G data network. Currently, the Amazon Kindle, the Sony Reader Daily Edition and the Barnes & Noble Nook are all using AT&T for data connectivity. During the fourth quarter, the number of these devices on AT&T’s wireless network increased by more than 1 million in the fourth quarter, which was the strongest quarter in this category to date. And as we learned yesterday, AT&T will also provide internet connectivity for Apple’s new iPad. It is expected that this category will continue to grow like gangbusters, especially with the addition of the iPad, which boasts an app called iBooks, Apple’s own collection of digital books formatted for the device. Apple partnered with five publishers to make books available for sale through the iBooks store. Jobs claimed yesterday that the iPad will take Amazon’s Kindle technology to the next level. The iBooks support the ePub format, allows readers to flip through pages and supports pictures, video, and other graphics. The first book available will cost $14.99. It’s expected that the eReader market as a whole will grow by millions in 2010, with Forrester predicting that 10 million e-readers will be sold in the coming year. 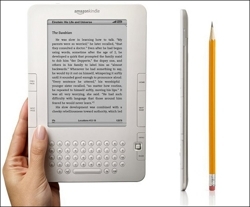 The firm estimated that 3 million eReaders were sold in 2009. So what does this mean for AT&T? More money, obviously. The company said that its earnings were partly bolstered by the rapid growth of the e-reader device. AT&T only recently brought the Kindle on board, after Amazon dropped Sprint last fall for the Kindle 2. However, while all Kindle’s come with a data plan, not all iPads will come with 3G connectivity. Only the most expensive ones will. All models also connect via WiFi.